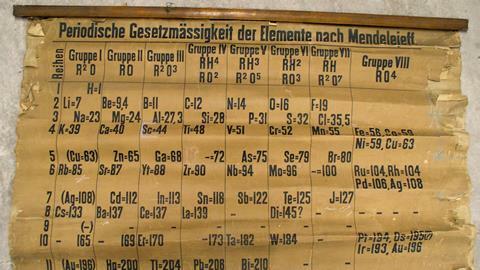 Is this the world’s oldest classroom periodic table? In 2014, the chemistry department at the University of St Andrews, UK, was instructed to clear out a storage area below one of its main lecture theatres to comply with fire safety regulations. The area was full of chemicals, equipment and laboratory paraphernalia that had accumulated since the opening of the Purdie Building in 1968. It took months to sift through the emerging material. Towards the end of the process, a stash of rolled up teaching charts emerged that had clearly been transported from the earlier chemistry laboratory in the centre of town. Within this collection was a large, extremely fragile canvas that flaked upon handling. It might be the earliest surviving example of a classroom periodic table in the world. The unearthed table is similar, but not identical, to Dmitri Mendeleev’s second table of 1871. It is annotated in German, and an inscription at the bottom left – ‘Verlag v. Lenoir & Forster, Wien’ – identifies a scientific printer who operated in Vienna between 1875 and 1888. Another inscription, ‘Lith. von Ant. Hartinger & Sohn, Wien’, identifies the chart’s lithographer, who died in 1890. We sought advice from a series of international experts, but no earlier lecture chart of the table appears to exist. 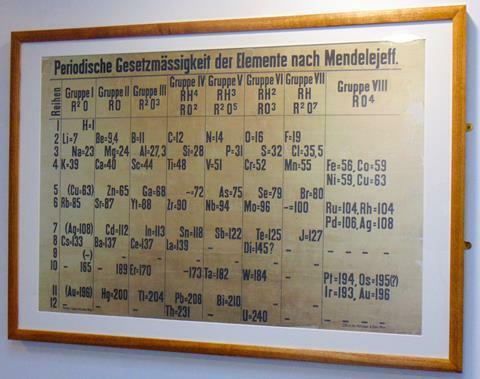 Eric Scerri, an expert on the history of the periodic table based at the University of California, Los Angeles, dated the table to between 1879 and 1886 based on the represented elements. For example, both gallium and scandium – discovered in 1875 and 1879 respectively – are present, while germanium, discovered in 1886, is not. In view of the table’s age and emerging uniqueness, it became prudent to have it restored. This delicate operation was carried out by Artworks Conservation’s Richard Hawkes and involved the surface of the table being completely removed from its canvas backing and then soaked in an alkaline, magnesium bicarbonate solution. The surface was then translocated onto a new backing, and missing fragments and tears were filled with paper mulberry to give a more complete image. 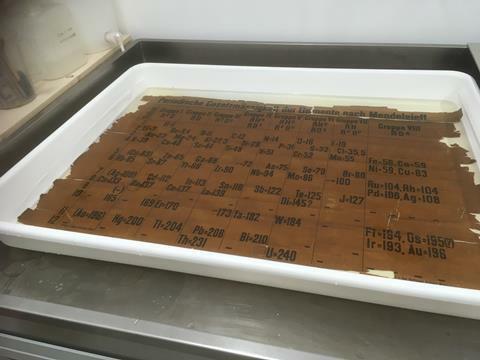 The table is now stored in Special Collections at the university library and the School of Chemistry has a high quality facsimile on permanent display. Who brought the table to St Andrews? One suspect is Thomas Purdie, who was professor of chemistry from 1884–1908. Purdie’s appointment was a step-change in experimental research at St Andrews. The previous incumbents had been mineralogists, whereas Purdie had been influenced by the substantial growth that was taking place in organic chemistry at that time. He started a research activity at the university that laid the foundation for the careers of carbohydrate pioneers such as Edmund Hirst, Norman Howarth and James Irvine. Purdie had worked in Würzburg in Germany immediately prior to taking up his chair at the university. Did he bring the table to St Andrews on his arrival in 1884? The Table, printed in Austria in 1885 was ordered by Professor Purdie in 1888 from a supplier in Bonn for the sum of three Goldmarks. An investigation was carried out in order to trace its provenance. An exhaustive search on lists of chemical resources resulted in an entry for a periodic table bearing the same title, published in Vienna in 1885. 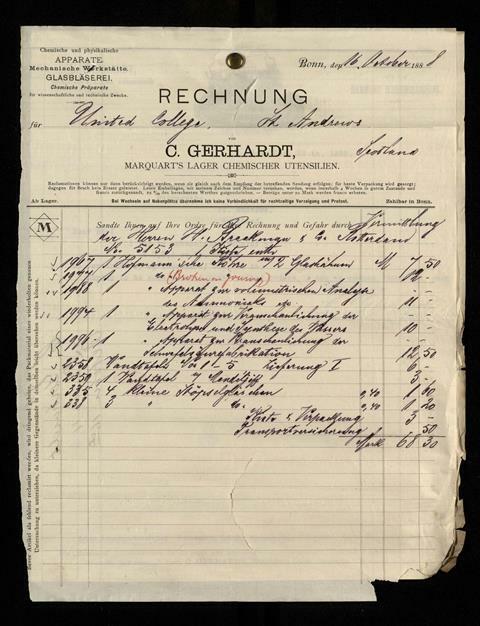 Keeping this in mind, a search of the university records found details of the purchase of a periodic table by Purdie in 1888 from the catalogue of C. Gerhardt of Bonn. It cost three Goldmarks (£17.30 today). This entry – and evidence of purchase by mail order – appears to define the provenance of the St Andrews periodic table. The story itself is not remarkable – a new professor setting up in a new position would want the latest research and teaching materials. But this table appears to be the only surviving one from this period in Europe. We are very keen to know if there are others out there that are close in age or even predate the table. The authors would also like to thank Rachel Hart, Erica Kotze and Gabriel Sewell from the University of St Andrews’ Special Collections team, who oversaw the conservation of the table.